« The Art of the Possible: Staying motivated as times slow with age. This is a guest post by TI Swimmer Doug Alt. Total Immersion is described as a program that can “Change Your Life.” It has indeed changed mine, putting me on a path toward my 70s enjoying a rising curve of physical and mental health. Swimming was never a major part of my life. I’d ‘learned to swim’ in camp and even earned a Red Cross Lifesaving certificate, but never thought of myself as a swimmer. For 40-plus years since college, my swimming was limited to an occasional pool length or two, or body-surfing a few times each summer. At age 64, I saw an advertisement for the Ray Licata Memorial Swim, an ocean mile at Long Branch, NJ. Because it was labeled a swim rather than a race (and the organizers promised plenty of support boats, kayaks and lifeguards along the course) I decided to give it a go. I practiced my crude crawl between the ropes at my local beach a dozen times, covering at most about a half-mile. I doubted I could swim continuous crawl the whole way, but was willing to do whatever it took–elementary backstroke, sidestroke, even bobbing–to reach the finish line. I was elated to finish in 70 minutes. The next two summers, I entered three more mile events along the Jersey Shore, and managed to squeak under an hour. But each was an exhausting ordeal, leaving me feeling like a basket case for a day or two afterward. At age 67, while searching the NJ Masters web site to find an indoor pool, I saw an ad for Total Immersion. In November of 2009, I bought the TI book and Self-Coached Workshop DVD, began learning the drills, and got hooked. I bypassed the 2010 events, preferring to practice until my new technique was solid enough to endure an extended-distance swim. I had a coaching session with TI Coach Mike Trunkes in New Paltz, NY and became a regular on the TI Discussion Forums , where I received invaluable help and support from fellow TI enthusiasts. In 2011, I finished the Manasquan Mile in 45 minutes! Besides being thrilled with the 25 percent time improvement, I waltzed out of the water at the finish, tossed on my shirt, shorts and sandals, and drove off to complete a busy schedule for the rest of the day, marveling at how relaxed and enjoyable the swim had been. Even more important than the feeling of accomplishment from events like the Manasquan Mile, is the daily mental stimulus of TI Practice. Practicing with deep concentration replaces life’s usual distractions with the Flow State Terry has written about. I finish each practice feeling physically and mentally refreshed and with a pronounced sense of well-being. Improvements in SPL or Tempo—or the coordination of my 2-Beat Kick, are icing on the cake. 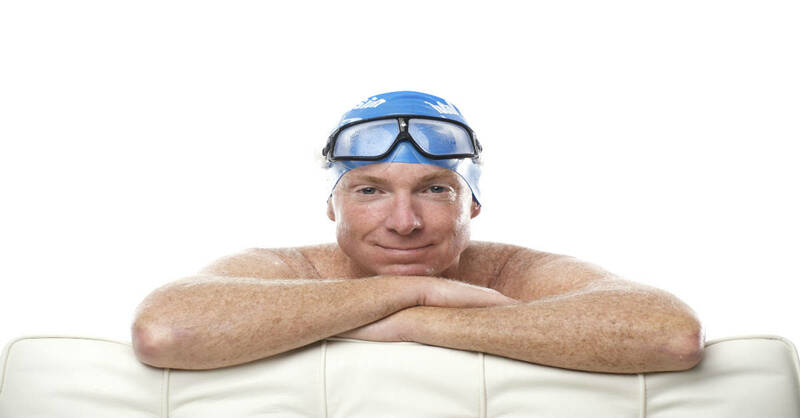 Practicing with strong and targeted focus has also introduced me to the “cocoon of calm,” which allows me to swim in open water swimming with new confidence. Now, when I experience currents, rips, rougher surf, or cold water upwellings, I relax and concentrate on a Stroke Thought until my fingers scrape the sand. I anticipate each swim as an opportunity to experience Flow and improvement. Look out 70… Here I come!!!! Doug Alt studied piano and sang in choral groups in New Jersey and Massachusetts during high school and college. As a collegiate gymnast, he placed 7th in All-Around at the 1965 U.S.G.F. Nationals. From 1966-68 Doug taught physical education and played in a rock-and-roll band, before serving in the Army from 1968-70. From 1971-78, he owned a chain of gymnastic schools and summer camps and created the first gymnastics Coach Training School in the country. After a long hiatus from music, Doug bought an electronic piano in 1996, practicing silently, using headphones, late at night. At age 55, he began playing part-time at weddings and restaurants. At 62, Doug’s employer, Ernst & Young moved his job overseas and he made the jump to being a full-time musician, doing 15-20 performances per month, both singing and piano/vocal concerts. Doug’s web site. My wife, Carolyn, emailed this note to me after reading the blog-post above. My husband is a visionary with a keen intellect. He has many strengths and has achieved great heights over the years in some of his chosen pursuits: as a musician and as a nationally-placed gymnast and leader in the early days of the gymnastics school industry in this country. With large dreams, he’s also had his share of failures and frustrations. The concepts of Focus, Balance and the Cocoon of Calm have made an amazing difference not only in his personality, but also in our relationship. These days his positive energy is contagious. At a time when most people are winding down, Doug is winding up – and loving life! I’m proud and happy for him and excited for us. but as a leg-heavy tennis player, I need some thing or someone for a piece of advise to start! Is there a certified coach or institute for this purpose in Taiwan? Never too late. I’ve put you in touch with TI coaches in Taiwan.